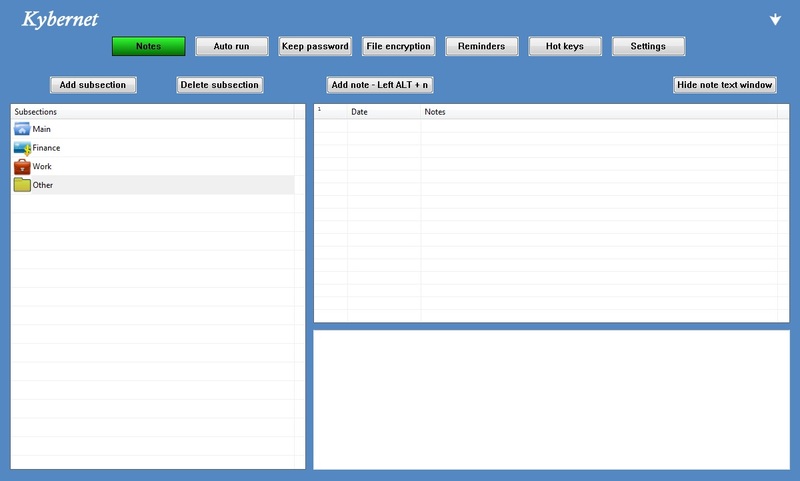 Quick notes, auto run, passwords manager, file encryption and others. Kybernet 2016 was available as a giveaway on May 30, 2016! How would you improve Kybernet 2016? resize the window! won't fit on screen!! Trying 2 b Helpful, Kybernet that compiled on Windows XP does not work on Windows 10. And vice versa! Kybernet that compiled on Windows 10 does not work on Windows XP. At the moment, we do not know how to solve this problem! Microsoft officially declares about backward compatibility of programs, but in practice things are a little different! So we decided to focus on newer systems! Trying 2 b Helpful, Kybernet that compiled on Windows XP does not work on Windows 10. And vice versa! Kybernet that compiled on Windows 10 does not work on Windows XP. At the moment, we do not know how to solve this problem! Microsoft officially declares about backward compatibility of programs, but in practice things are a little different! So we decided to focus on newer systems! Lenny, you can download program from our site www.kybernetiks.com But it's will be trial version. Promo action is over. Jim, we appreciate your feedback! And we will always improve the program to make your work with the computer more comfortable! I tried AutoRun funtion to open a website at certain interval but i cannot choose browser. Choosing browser would be great! Easy-as-pie registration. I like this program a lot. While it's true that each of its components is readily available via other programs, I like having them all together like this. In addition, the interface is clear, and everything seems to be intuitive to use. Thanks very much, GAOTD and Kybernetiks! You do not need this. There are separate freeware programs that excel in each of the capabilities: Quick notes; Auto run; Passwords manager; File encryption; Messages reminder; You do not need this. ric, This is a review of the program? Whether an individual needs or wants to use this program depends on each individual and what they need or want. I agree that there are individual programs out there that shine at each individual task, but no program I know of that combines all in one program. I will give it a try. If you give it a try come back and let us all know what you think. ric, This is a review of the program? Whether an individual needs or wants to use this program depends on each individual and what they need or want. I agree that there are individual programs out there that shine at each individual task, but no program I know of that combines all in one program. I will give it a try. If you give it a try come back and let us all know what you think. Easy download, easy registration, and easy to use. It says what it does and does what it says. I've tried it and I'll keep it.